Do they really matter? Absolutely, YES!!! There is immeasurable value in your logo and visual brand! Did you know your logo alone has the power to attract new customers! A logo that portrays the right message to it’s intended audience has a better chance of winning customers compared to one that was poorly thought out and not clearly representative of the business. I bet you can think of at least one buying decision you have made recently where your first impression was based on whether the company’s logo and visual branding looked professional or not. A strong logo and visual brand has the power to influence people to believe that your company will provide a quality product or service, even when they have no previous interaction with you! That is powerful. Isn’t it time for you to embrace this power? To create a positive first impression. To visually identify the who and what of your awesome business. To set your business apart and give you the edge of differentiation. To convey that you are reputable and trustworthy. To show you are a serious business, not just a freelancer. To build recognition by creating memories and positive experiences with those who interact with your brand. To appeal to your audience and encourage interaction. To build a foundation for the success of your company. This comprehensive, brand discovery exercise is helping small business owners get CLEAR on their brand image and how they want people to perceive their awesome businesses. 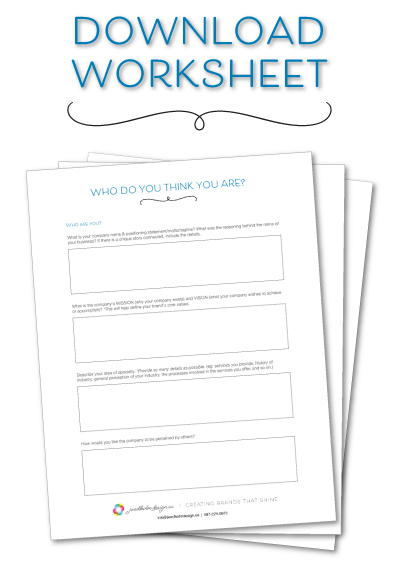 Download the FREE worksheet and fill it out TODAY! Take the first step to clearly define your brand. Using this as your foundation we can create your new logo and visual brand! How does your company’s image and messaging resonate with your audience?